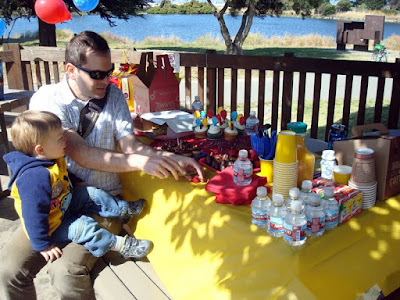 This post is an example of one of the few times in my life when I cannot easily compartmentalize events into one of three blogs: business, pleasure, or family. And since this blog has become a kind of junk drawer of my blogging activities, I figured it's as good a spot as any to share some of the projects I took on to celebrate my son's 2nd birthday this past weekend. First priority, of course, was sending out the invites. 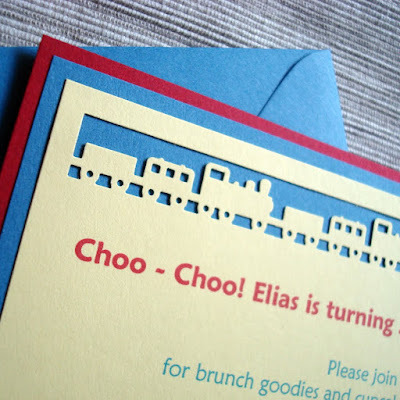 Since my son is obsessed with trains, we went with the popular "choo choo, my kid is 2!" theme. He loves him some Thomas the Tank Engine specifically but I wanted to keep the theme a bit more general so I borrowed the franchise's palette only, working with primary colors and general train imagery. 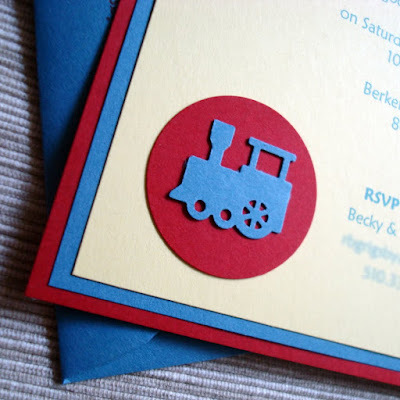 I carried the train theme over to the other paper goods I created for the party, primarily the favors for the kids and their parents. 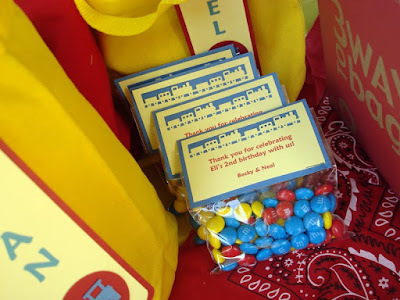 I got red and yellow canvas bags from Michael's and filled each with various train-themed goodies, including a conductor's hat, Thomas train whistle and stickers, and train-shaped straw cups, most of which I ordered from Birthday Express. I decided to use the red bandanas I ordered with the hats in place of tissue paper in the bags (and I used the couple of extra bandanas I had on hand as part of the table decorations). 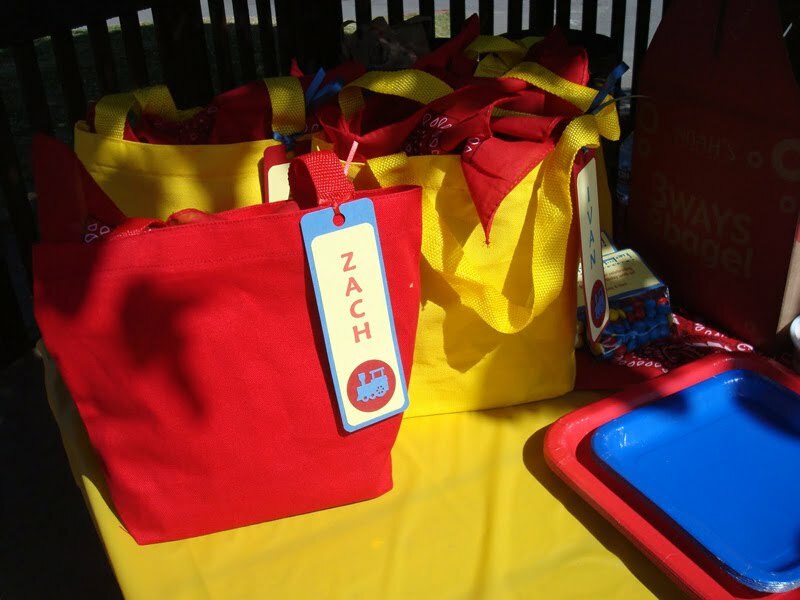 The hangtags are designed to be untied and re-used as bookmarks, if the guests are so inclined. I'm a big fan of incorporating M&Ms into your event design whenever possible, but didn't have the time or budget to buy custom favors. So I bought a big bag and sorted out all the red, yellow, and blue candies and made additional little favors for the parents to take home. 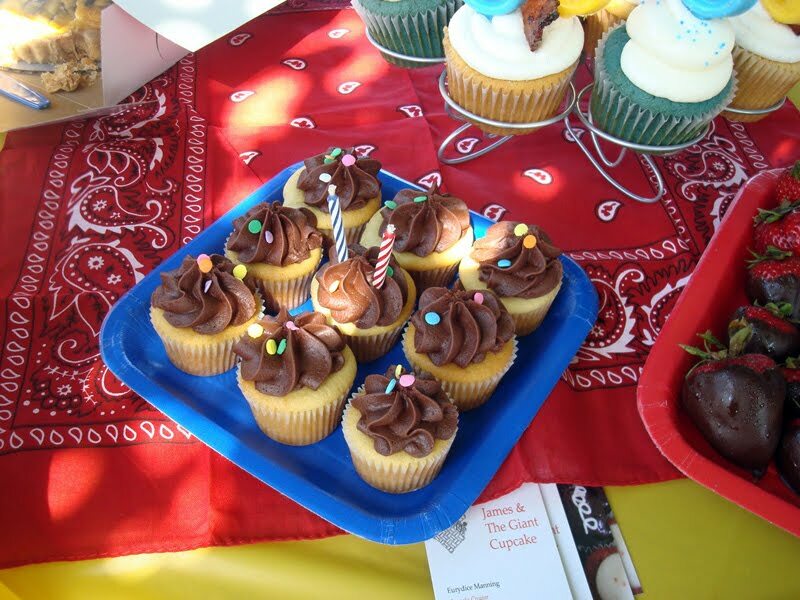 And to top it off, I added a dozen mini cupcakes in the "Birthday" flavor - classic yellow cake with chocolate buttercream frosting. Mmm. 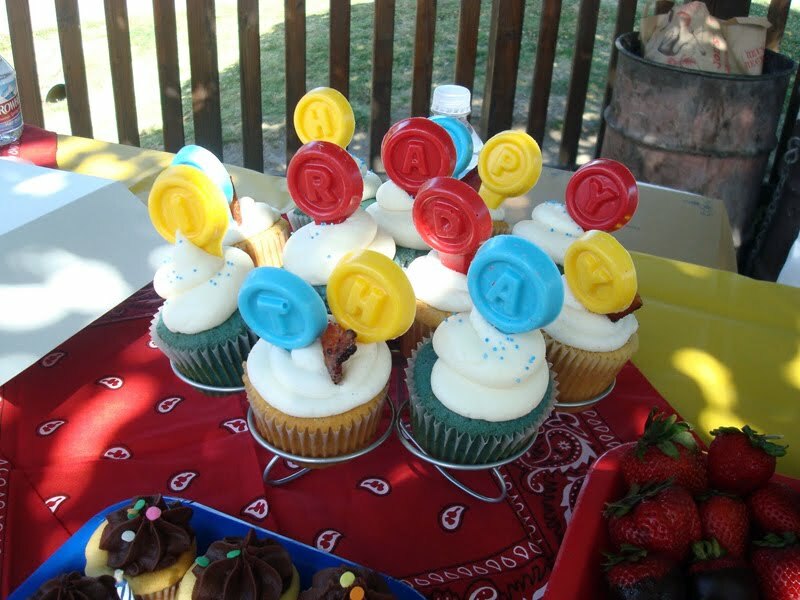 My original plan was to make cupcake toppers that coordinated with the other paper goods for the party but by about Tuesday last week I knew I wouldn't have time. I've always wanted to try remelting and molding my own chocolates so I went with these edible toppers instead that spell out "Happy Birthday". My only regret is that I didn't include my son's name anywhere in the cupcake presentation but he'll be getting a train cake this week when we celebrate again with his daycare buddies, so I have another chance to do right by him! Did you miss out on the "droidette" phone cozy giveaway a couple of months ago? 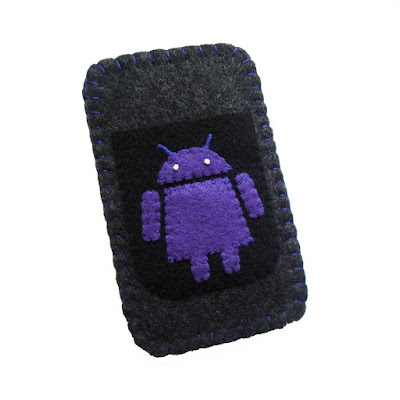 Well, you're in luck because now you can buy your very own Android phone case, customized with the Women with Droids "droidette" logo, in your choice of felt colors (or as shown, using charcoal gray, black, and orchid purple felt). I'm still selling the basic and version 2.0 Android phone cases in my Etsy shop, but after the giveaway, the gals at the Women with Droids site asked if I'd be interested in making and selling the droidette version exclusively on their site. Um, yeah. And when you buy a case from them, you're supporting me and the site!